Fishing with Capt. Dave there was something awesome reported while stake-up bonefishing. Key Largo bonefishing provides shots at large fish, stake-up fishing is a good bet when it’s windy and/or rainy. You simply position yourself on the edge of on a flat and put your shrimps on and sit and wait. Pre-cold fronts are often a spectacular time to fish as the bones can often go nuts foraging to prepare for the temperature drops. This is a often way to catch many bonefish, as well as shots at permit, or in this case, big mutton snapper! These muttons are an unusual catch while flats fishing key largo. Definitely some good eating fish! At first it was thought these guys were permit as they were making some erratic movements, then discovered they were these nice key largo mutton snapper fish! Also caught was a nice bonefish and a permit. Not bad for a half day late afternoon key largo fishing charter! 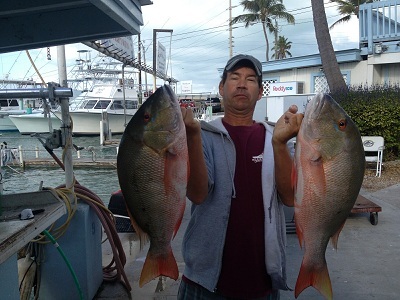 This entry was posted in Fishing Reports and tagged bonefish, Key Largo, mutton snapper, permit. Bookmark the permalink.